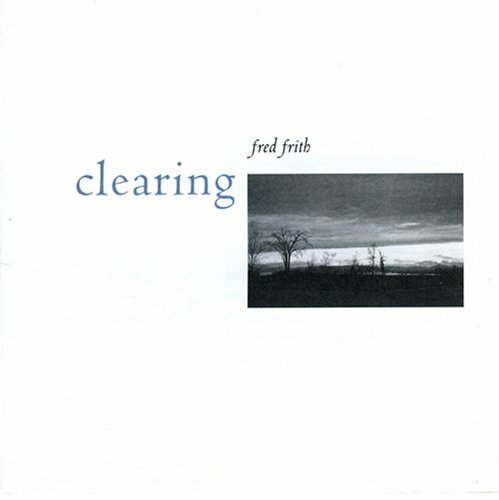 Although he is one of the foremost free improvising guitarists of his generation, Clearing is only Fred Frith's third solo guitar album, following on from Guitar Solos (1974) and the ultra rare Live in Japan (1981). The album was commissioned by John Zorn and most of it was recorded in Germany in 2000. In the years between his first solo albums and this, Frith greatly expanded his range of guitar techniques and collaborated with other improvisers all over the world. Where Guitar Solos sometimes felt like a slightly disjointed showcase for the techniques Frith was experimenting with at that stage of his career, much of Clearing is like a seamless exposition of the possibilities opened up by them, with one piece flowing into the next and a feeling that the album as a whole has a well defined structure. The opening piece, White, has an acoustic sound and recalls Not Forgotten and Hollow Music from Guitar solos. Here Frith has the confidence to let his quiet, low key playing unfold over nine and a half minutes, and conjures up a peaceful, contemplative mood that has something in common with the environmental land art of Andy Goldsworthy, to whom the piece is dedicated. This is followed by a series of pieces which feature the unorthodox sounds of prepared guitars interspersed with more conventional playing; Chains was created by placing a tin across the guitar strings and dropping chains into it, but this is followed by another introspective acoustic interlude in The Bow Moon. Minimalism has the guitar strings being played with drumsticks and sounds like a one man Steve Reich ensemble, while both the subsequent pieces move from one sonic idea to the next with a logic of their own. Towards the end of the album there are two pieces from different sessions; Gaifu Kaisei (in memory of Akira Iijima) is played on a guitar with a chopstick between its strings and was recorded some four years earlier at the same studio, while The Earth Is A Flower was recorded live at a festival in Poland. Although these are both good pieces and worthy of inclusion, they rather disrupt the flow of the album and would perhaps have been better sequenced as the final 2 tracks. Improvised music is often seen as difficult and inaccessible, and Fred Frith has visited the outer limits of listenability during his lengthy career, but most of Clearing manages to strike a balance between the accessible and the avant-garde. If you're a fan you'll love it, and if you're curious to explore the world of free improvisation on the electric guitar this is probably the best place to start.